Fernando Hierro resigned his position as sporting director of the Spanish Federation and his interim position on the bench, and Luis Enrique has quickly been installed as the favourite to take over national team coaching duties. Except for a big surprise, Luis Rubiales will propose the former Barcelona man to the Board of Directors during a meeting on Monday (11:30 CET) to be held at the headquarters of Las Rozas. Although in recent days other alternatives such as Quique Sanchez Flores, Michel, Roberto Martinez and Victor Sanchez del Amo have been talked about, the truth is that the president of the Federation has always valued Enrique. He would sign for two years until the 2020 European Championship, and meets all the requirements that Rubiales was looking for after the traumatic departure of Julen Lopetegui. 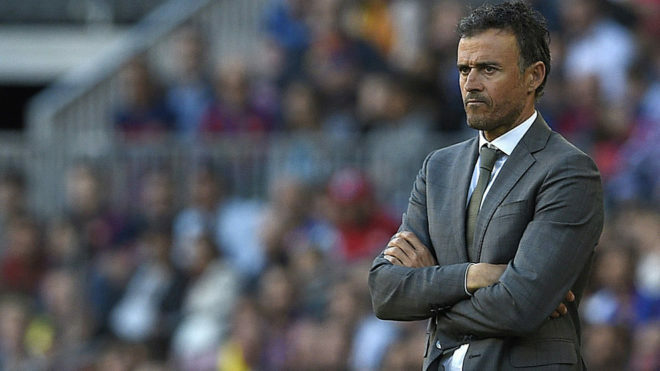 Enrique is Spanish, has no contract in force, has international experience, is used to dealing with players of the highest level and has always recognised that he would love to coach Spain. “Would I like to be coach of the national team? Yes, a lot,” he said two years ago when he was training Barcelona and asked about the possibility of succeeding Del Bosque. Everything indicates that his moment has arrived. He was enjoying a gap year after his brilliant cycle at Barcelona, where he achieved no less than nine titles in three seasons (2014/17), including a historic treble in 2015. He previously coached Celta (2013/14), Roma ( 2011/12) and Barcelona B (2008/11). In the last two months he had been linked to Chelsea and Arsenal. Luis Enrique is a coach with a strong personality, which has generated friction with his players (Jordi Alba, for example). His experience at Barcelona with Messi helped him mature in dealing with figures and learned not to be so intransigent, and his teams are characterised by aggressive play and rapid transitions. That competitive character and the fact that at Barcelona he evolved the prevailing tiki-taka to a more vertical football style, are two of the main reasons for him to be chosen. He will probably be asked to improve his relationship with the media, which has been very poor.